Indigenous Health supports Northern Health in its commitment to partner with First Nations, Métis and Inuit peoples and to build a health system that honours diversity and provides culturally safe services. Indigenous Health is a small dedicated team within Northern Health. Our scope of work is regional - across all of northern BC. Our main office is in Prince George and one team member is located in Terrace. 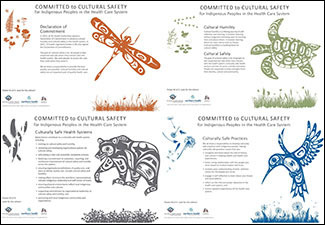 A series of 4 colourful posters on cultural safety. Easy to print and post in your workspace!